Another fun summer day for a family ride! 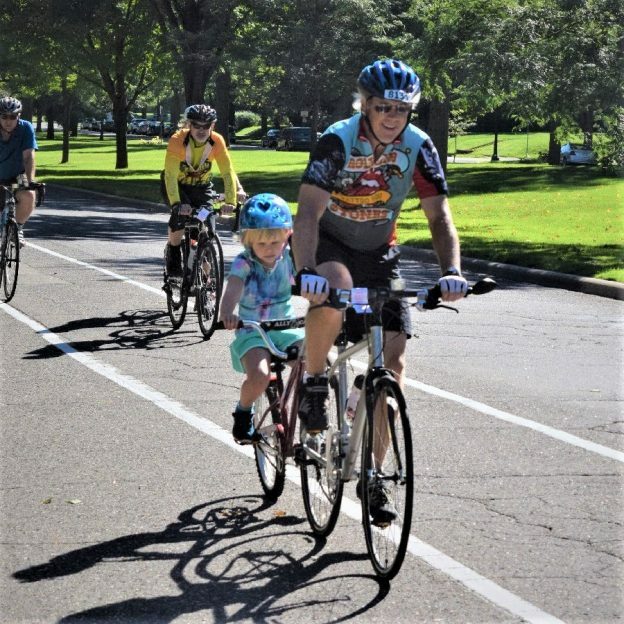 Here in this bike pic we captured this father/ daughter pair out pedaling on Summit Avenue, getting in shape for Minnesota’s 24th Annual St Paul Bicycle Classic coming September 9th. This entry was posted in Picture of the Day and tagged #nextbikeadventure, Bicycle Alliance of Minnesota, BikeMN, family memories, kids cycle trailer, Minnesota Bike Guide, Minnesota trails, picture perfect, Ramsey County Park, ride right, St paul Bike Classic, tag-along, touring, trail-a-bike, trailer cycle on August 25, 2018 by Russ Lowthian. 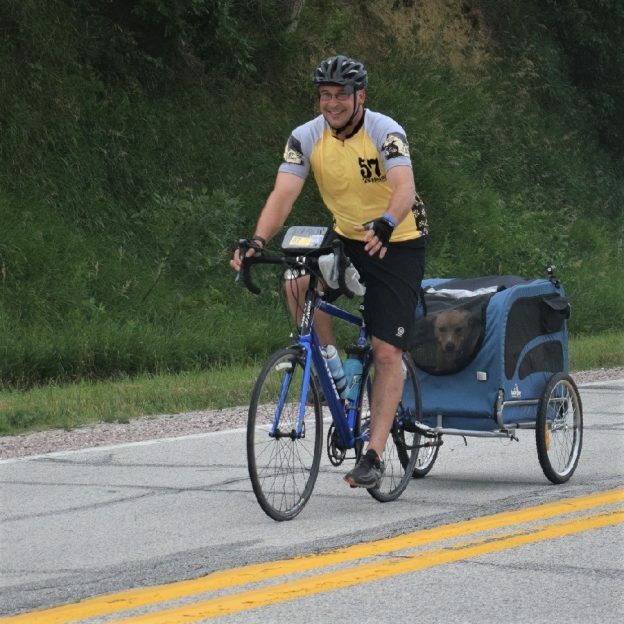 This Bike Pic Friday we are showing you another biker dude, with his faithful companion in the burley making memories, riding across Iowa several weeks ago. Along the way it seems everyone had a good time. See more photos at RAGBRAI 2018. This entry was posted in Picture of the Day and tagged #nextbikeadventure, Across Iowa, bike guide, Bike Iowa, biker dude, dog on a ride, family memories, Free maps, Iowa, kids cycle trailer, picture perfect, RAGBRAI, ride right, road biking, touring, trailer cycle, yeah its Friday on August 24, 2018 by Russ Lowthian. 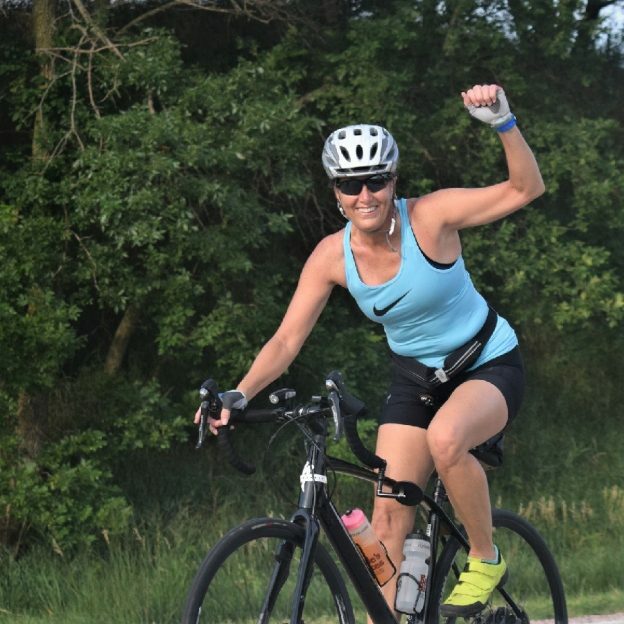 This Bike Pic Friday we are showing you another biker chick having fun and making memories, riding across Iowa a few weeks ago. Along the way it seems everyone had a good time. See more photos at RAGBRAI 2018. This entry was posted in Picture of the Day and tagged #nextbikeadventure, Across Iowa, bike guide, family memories, Free maps, Iowa, kids cycle trailer, picture perfect, RAGBRAI, ride right, road biking, tag-along, tandem bike, touring, trail-a-bike, trailer cycle on August 17, 2018 by Russ Lowthian. Looks a little steamy today, here in this bike pic we captured another a biker chick and dude having fun pedaling into the morning sun. This picture was captured on a picture perfect day riding across Iowa on RAGBRAI 2018. This entry was posted in Picture of the Day and tagged #nextbikeadventure, Across Iowa, bike guide, family memories, Free maps, Iowa, kids cycle trailer, picture perfect, RAGBRAI, ride right, road biking, tag-along, tandem bike, touring, trail-a-bike, trailer cycle on August 13, 2018 by Russ Lowthian. 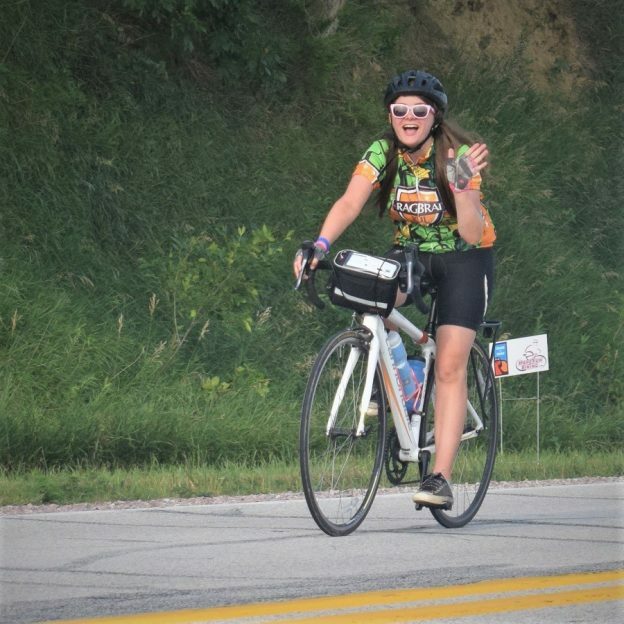 This Bike Pic Friday we are showing you another biker chick having fun and making memories, riding across Iowa a couple weeks ago. Along the way it seems everyone had a good time. See more photos at RAGBRAI 2018. This entry was posted in Picture of the Day and tagged #nextbikeadventure, Across Iowa, bike guide, family memories, Free maps, Iowa, kids cycle trailer, picture perfect, RAGBRAI, ride right, road biking, tag-along, tandem bike, touring, trail-a-bike, trailer cycle on August 10, 2018 by Russ Lowthian. 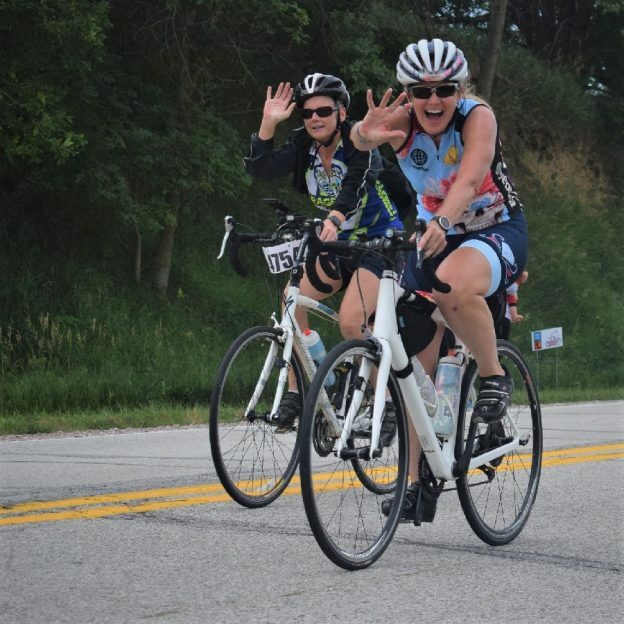 This Bike Pic Friday we are showing you some biker chicks having fun and making memories, riding across Iowa last week. Along the way it seems everyone had a good time. See more photos at RAGBRAI 2018. 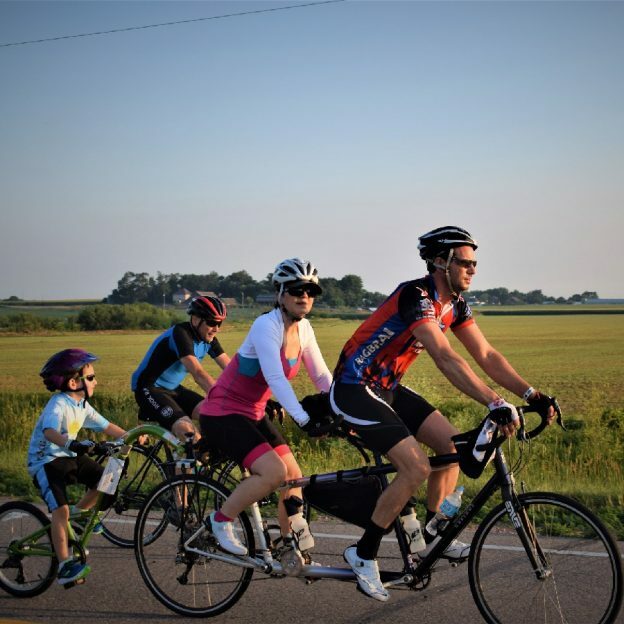 This entry was posted in Picture of the Day and tagged #nextbikeadventure, Across Iowa, bike guide, family memories, Free maps, Iowa, kids cycle trailer, picture perfect, RAGBRAI, ride right, road biking, tag-along, tandem bike, touring, trail-a-bike, trailer cycle on August 3, 2018 by Russ Lowthian. On this Friday this family is having fun and making memories, on a tandem bike with a tag-along (a.k.a. 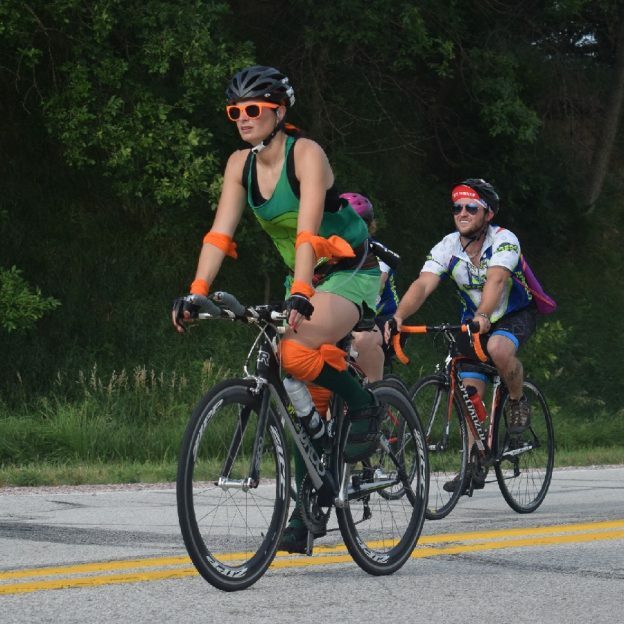 trailer cycle or trail-a-bike), riding across Iowa, on RAGBRAI 2018. This entry was posted in Picture of the Day and tagged #nextbikeadventure, Across Iowa, bike guide, family memories, Free maps, Iowa, kids cycle trailer, picture perfect, RAGBRAI, ride right, road biking, tag-along, tandem bike, touring, trail-a-bike, trailer cycle on July 27, 2018 by Russ Lowthian.